NTR Lunar Series 10 oz Bars. First Spouse 1/2 oz Gold Coin. Coins Remembered / Gift Ideas. "Birds of Prey" Gift Box. Perth Lunar Goat Gift Box. 2017 Silver Great Britain Queen's Beasts (The Red Dragon) - 2 oz (10 Coins). In this much anticipated series, the Royal Mint has once again proven its impeccable dedication to producing British coinage that faithfully represents the nation? With this third release of the Queen's Beasts series, the 2017 2 oz. 9999 fine silver Queen's Beasts Red Dragon silver coin most certainly demonstrates the finest of craftsmanship. Third in the ten-coin series, highly respected engraver, Jody Clark was selected to design the Queen? S Beasts Red Dragon of Wales. The intricate detail captured on the image is nothing short of inspiring. Contributing greatly to the decades of British heritage represented in the 10 original painted-plaster statues of 1953, this magnificent coin has been highly praised. Minted in high relief with highest purity and 2 oz weight, this silver bullion coin has become a highly treasured favorite among collectors and precious metals investors world-wide. S obverse displays Her Majesty Queen Elizabeth II, and the 5 pounds face value. S portrait was also designed by Jody Clark and adopted into British coinage since 2016. The reverse features a stylized and beautifully detailed image of the Red Dragon of Wales encircled with the inscriptions, RED DRAGON OF WALES? S initials are below and to the right of the shield. Third edition of a series of ten coins. Contains 2 troy oz of. Obverse: Displays Her Majesty Queen Elizabeth II, and the 5 pounds face value. Reverse: Features a beautifully detailed image of the fearsome Red Dragon of Wales, the date, and the coin? Individual coins come in protective plastic flips. Sovereign coin backed by the British government. The Queen's Beasts are ten heraldic statues depicting the genealogy of Queen Elizabeth II. The statues were created by the British sculptor James Woodford in 1953 for the Queen? S coronation, and temporarily set up in front of the western annex to Westminster Abbey - the coronation church of the British monarchy. Today, the almost 2 meter high painted plaster figures are on display in the Canadian Museum of History in Ottawa. In the years since, the Beasts have been reproduced in a variety of ways, including porcelain figures, tableware, candlesticks, teaspoons, and stamps. Now, after decades in waiting, the public is thrilled to see the Royal Mint? S commencement of this beautiful new series of coins depicting the Queen? This series is anticipated to include all 10 beasts, minted in 1 and 1/4 ounces of gold and 2 ounces of silver. 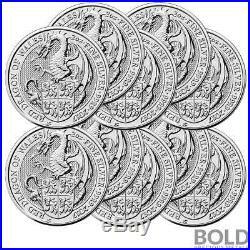 The item "2017 Silver Great Britain Queen's Beasts (The Red Dragon) 2 oz (10 Coins)" is in sale since Thursday, September 07, 2017. This item is in the category "Coins & Paper Money\Coins\ World\Europe\UK (Great Britain)\Commemorative". The seller is "boldpreciousmetals" and is located in Austin, Texas. This item can be shipped worldwide.